Donated items will be accepted at all home games in May. PENSACOLA, Fla., – For Military Appreciation Month, the Pensacola Blue Wahoos and Whataburger are teaming up for a second year to collect donations for USO Northwest Florida. 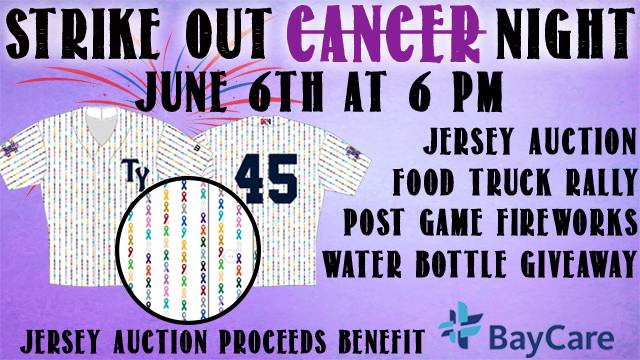 Donations will be collected during the Blue Wahoos’ home games during the month of May. The USO will deliver the items directly to the troops currently serving the United States. Fans who donate during the drive will receive a coupon for a free Whataburger. Donations can be dropped off at the entry gates. Individually wrapped salty and sweet snacks such as pretzels, cookies, peanut butter crackers, etc. Single-serve microwavable snacks such as mac and cheese, ramen noodles, ravioli, etc. Center supplies such as copy paper, dish soap, batteries, paper towels, etc. Whataburger has focused on its fresh, made-to-order burgers and friendly customer service since 1950 when Harmon Dobson opened the first Whataburger as a small roadside burger stand in Corpus Christi, Texas. Dobson gave his restaurant a name he hoped to hear customers say every time they took a bite of his made-to-order burgers: “What a burger!” Within the first week, people lined up around the block for his 25 cent, 100 percent beef burgers served on five-inch buns. Today, the company is headquartered in San Antonio, Texas, with more than 770 locations in 10 states with sales of more than $1 billion annually. The mission of the USO is to lift the spirits of troops and their families and that mission is accomplished on a daily basis thanks to the dedication and generosity of the American people. Whether it is a commitment of time from a volunteer or a contribution of dollars from a donor, the USO turns this generosity into centers, programs and services that reach troops in the most remote corners of the globe. 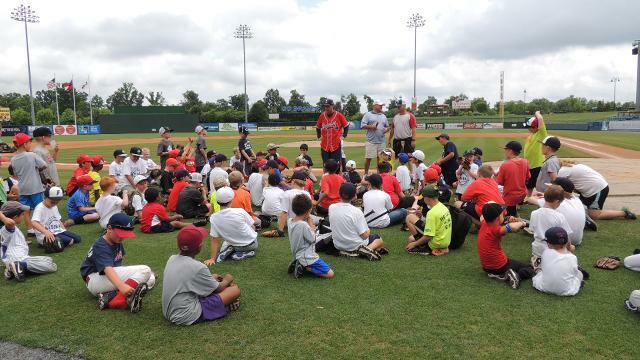 This article originally appeared on the official website of the Pensacola Blue Wahoos. Click here to view the original story. 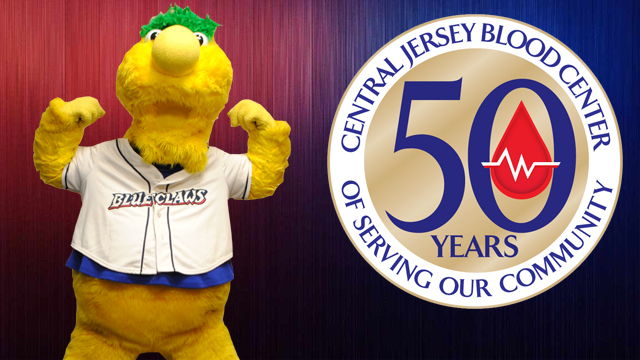 LAKEWOOD, NJ – The BlueClaws and Central Jersey Blood Center will partner on a Blood Drive on Saturday, May 9th that runs from 7 am – 2 pm. The drive will take place in the BlueClaws Executive Conference Center, and each donor will receive a pair of tickets to a future BlueClaws game. May 9th is also Bark in the Park, where fans can bring their dogs to the 4:05 pm game. There is a pre-game festival that starts at 1:30 pm and includes vendors, games, a pet adoption showcase, and more. Bark in the Park is presented by 100.1 WJRZ and 95.9 WRAT. (AKRON, OHIO) May 8, 2015 – The Akron RubberDucks are partnering with Northeast Ohio Roy Hobbs Baseball again to bring back “Challenger Day” on Sunday, May 10 at 12 p.m., prior to the finale of the three-game series between the Akron RubberDucks and the Binghamton Mets, which starts at 2:05 p.m. 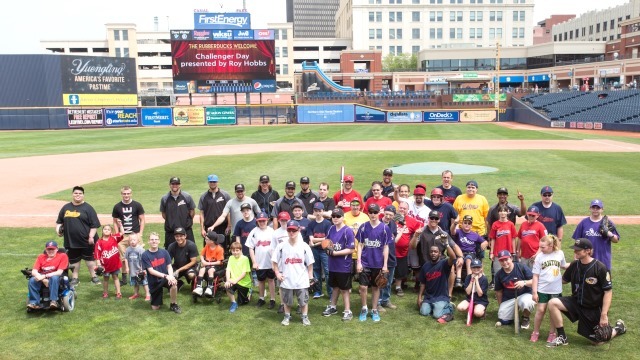 It will be the 17th year Challenger Day will be hosted at Canal Park, with the annual tradition started in 1999. This article originally appeared on the official website of the Akron RubberDucks. Click here to view the original story. Call the Rome Braves ticket office at 706-378-5100 for more information. Be sure to register your child as soon as possible to ensure a spot. Click HERE for registration form. CHARLESTON, S.C. – Donate a new or used pair of sneakers and we’ll give you a free ticket to see the Charleston RiverDogs battle rival Greenville Drive on Saturday, May 16, in what will be one of the most unique starts in baseball history. 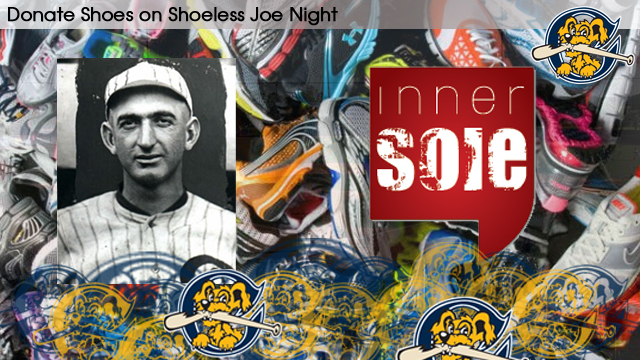 At this game, the Charleston RiverDogs will salute Greenville native “Shoeless “Joe Jackson with several promotions. First, fans who bring a pair of new or used sneakers to donate to University of South Carolina women’s basketball coach Dawn Staley’s INNERSOLE non-profit organization, will gain free admission to the game, which begins at 6:05 pm. And then prior to the game, both the RiverDogs and Drive will take the field for the National Anthem lined up on the first and third base lines – of course – shoeless. The teams will also take a shoeless photo in front of Shoeless Joe’s Hill in right field. INNERSOLE is a non-profit organization whose mission is to provide new sneakers to children who are homeless and children who are in need. This is a national and international initiative that will make a difference in the lives of our children by starting the school year off with a new pair of sneakers. Coach Staley serves as co-founder and president of INNERSOLE. “Shoeless Joe” Jackson played Major League baseball in the early part of the 20th century. He is remembered for his performance on the field and for his alleged association with the Black Sox Scandal, in which members of the 1919 Chicago White Sox participated in a conspiracy to fix the World Series. As a result of Jackson’s association with the scandal, Kenesaw Mountain Landis, Major League Baseball’s first commissioner, banned Jackson from playing after the 1920 season. Since then, Jackson’s guilt has been disputed, and his expulsion from baseball during the prime of his career made him one of the game’s legendary figures. Jackson played for three Major League teams during his 12-year career. He spent 1908-09 as a member of the Philadelphia Athletics and 1910 with the minor league New Orleans Pelicans before joining the Cleveland Naps at the end of the 1910 season. He remained in Cleveland through the first part of the 1915 and played the remainder of the 1915 season through 1920 with the White Sox. Jackson, primarily a left fielder, currently has the third-highest career batting average in major league history. In 1911, Jackson hit for a .408 average, and it remains as the sixth-highest single-season total since 1901, which marked the beginning of the modern era. Babe Ruth reportedly said that he modeled his hitting technique after Jackson’s. The right field area in the RiverDogs’ facility – Joseph P. Riley, Jr. Park – is named “Shoeless Joe’s Hill,” in honor of the Greenville native. For additional information and to secure your tickets, please refer to www.riverdogs.com or contact the box office at (843) 577-DOGS (3647). If you can’t make the games, remember that RiverDogs baseball can be heard throughout the season on the flagship radio home, WTMA 1250AM.